What options are there for feedback criteria in a Peer Review, Assignment Review, Group Member Evaluation and Skill Feedback assignment? 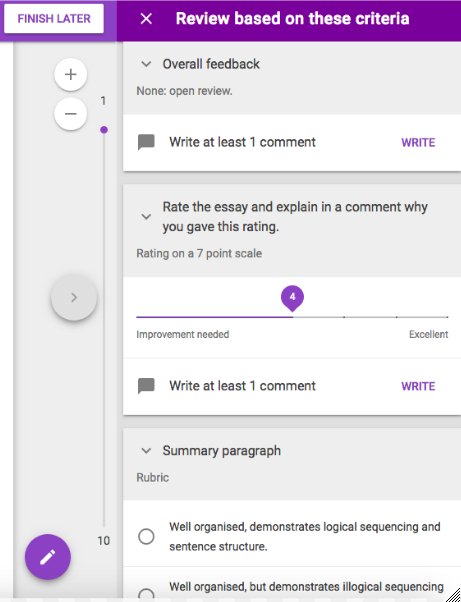 Add feedback criteria to guide students in their feedback process (using Peer Review or Group Member Evaluation), or to structure the feedback you provide to your students (using Assignment Feedback or Skill Feedback). 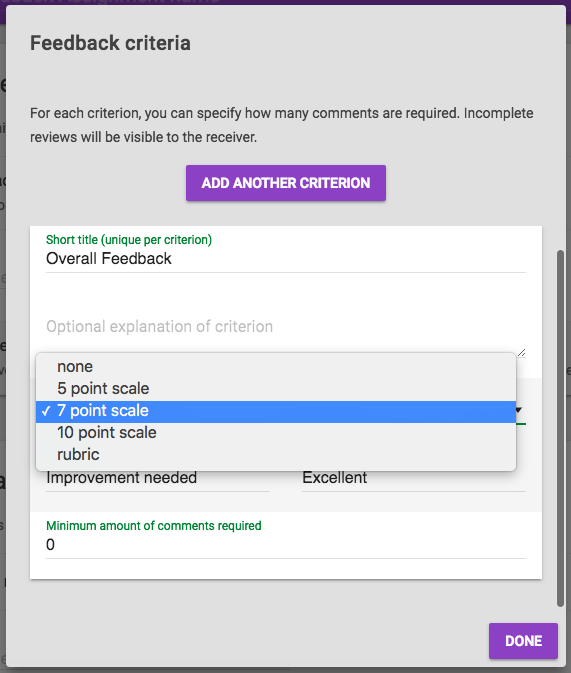 When setting up a FeedbackFruits assignment tool, in step 2 (Group member evaluation/Skill Feedback) or 3 (Peer Review/Assignment Feedback), you can select feedback criteria. Click change to navigate to the following window. Click add another criterion to add as many criteria as needed. In practice we have found that 3–7 criteria works best. This allows enough structure for students to give detailed feedback, while still allowing students to maintain oversight. Each criterion needs to have a title, a further explanation of the criterion is optional. None (open question). No rating or rubric needs to be given/filled in. Feedback is provided in comments. Most often used for feedback that is strictly qualitative. Ratings given on a 5, 7 or 10 points scale. When moving the slider, the reviewer will see numbers that indicate grades. Only the first and last point on the scale are named. By default the beginning and end of the scale are named “improvement needed” and “excellent.” You can customize this by changing the text under the headers begin scale and end scale. Rubric. Use this option if your criterion cannot be rated on a scale. Instead of giving a score, students choose which of the options you provide best applies to the work. Enter a description for each level and click add another to add a level. For each criterion you can set a required amount of comments: specify how many comments related to the criterion the reviewer is required to write. When you are finished adding criteria, click done. The screenshot below shows the student view of the criteria, which will be listed in a sidebar on the right of the screen. Click the screenshot below for more details about the student view.